Dove In Flight – The great, great grandparents of Lynda Prong, William and Catherine Hilborn, purchased this property in 1862 from John Mills. The Hilborn’s were Quakers from Pennsylvania. 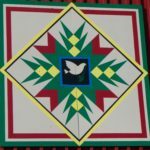 The dove in the centre of the quilt square represents a Quaker symbol. Their only daughter, Rosetta Hilborn (2nd generation), married William Bailey and obtained this property. Their elder daughter, Ethel Bailey (3rd generation), married Charles Denniss and bought the same property. Original Barn is pictured in 1872 Elgin County Atlas and was burned in 1932. Present barn was built in 1934. Their only son, Philip Denniss (4th generation), married Jean Parish and they carried on a registered Holstein dairy operation. This is when the farm name Sprucedene (meaning rolling hills) was registered as the prefix for registering cattle with the Holstein Freision Cattle Association. In 1970, their elder daughter Lynda Denniss (5th generation) and son-in-law Ron Prong purchased this property. A beef operation was carried on for a number of years. Since 1984 this land has been cash cropped using conservation tillage methods. The land has been rotated over the years in corn, soya beans, wheat and alfalfa. 1983 was the last year a mouldboard plow was used on this land. The cedar branch in the dove’s beak is a symbol for the many trees planted on this property since 1970. At least one tree and usually more have been planted each year till the present.The cedar branch also has masonic significance. ”Saving Our Soil” is the farm motto.